PT Perusahaan Listrik Negara, Indonesia's state-owned power company, has invested in energy efficiency projects to improve its power distribution performance. Photo credit: ADB. 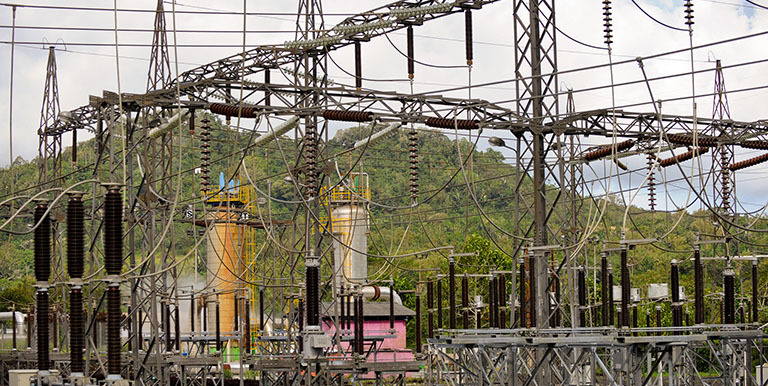 Households in Indonesia connected to the Java-Bali electricity grid now enjoy the comfort of a steady stream of electric current powering their homes. ADB's Java-Bali Electricity Distribution Performance Improvement Project has rehabilitated and strengthened the state-owned power company Perusahaan Listrik Negara (PLN) distribution network to reduce energy losses and meet the country’s rising electricity demand. For Indonesia’s energy sector, it was a difficult balancing act. Higher energy demand requires higher cost for power generation and, consequently, greater CO2 emissions. But better system performance, brought on by the project, would translate to less distribution losses and more electricity supply to a larger number of energy users, and hence reduction of CO2 emissions. Backing the project is a co-financing partnership between ADB and the Agence Francaise de Developpement (AFD), and the full support of the Government of Indonesia, which is keen on implementing its energy conservation and energy efficiency initiatives. Indonesia is among the top 20 polluters in the world, with annual emissions from 250 to 280 million tons. About 56.5% of annual CO2 emission is from oil burning, 35% from coal, and 18.5% from gas. The energy sector is a major emitter. If no effort is made to reduce emissions, total CO2 emissions from the energy sector could reach 1,200 million tons by 2025. The Electricity Business Plan (RUPTL) supports the government’s commitment to reduce greenhouse gas (GHG) by 29% by 2030. As indicated in the RUPTL 2018-2027, PLN will implement GHG reduction policy through renewable energy development, fuel switching, and low carbon technology. These efforts will help reduce CO2 emission that could potentially rise with the country’s increasing electricity demand. The project used three types of investments that optimized energy distribution from 2012 to 2015. The first investment reduced distribution losses by installing additional and larger conductors that covered about 54% (3,751 circuit-kilometers or ckm) of additional medium voltage circuits installed on the Java-Bali distribution networks over the project implementation period. The length of the medium voltage circuit installed by the project ensured that approximately half of the distribution losses in the grid can be directly attributed to the project. The second investment increased electricity sales by installing a total of 359 megavolt-amperes (MVA) of additional distribution transformer capacity and a further 51 MVA installed after the loan closure. This was enough to increase sales by 950 gigawatt-hours per annum. and accommodate about 600,000 residential customers. The third investment of the project made electricity reliable in the Java-Bali network by installing covered conductors in areas prone to outages. To measure results of this investment, PLN used its electronic customer information system in 2015 instead of its usual manual estimation to provide an accurate count of customers affected by each interruption. Besides the promise of less frequent power interruptions and power fluctuations, the project included a street lighting program for key cities. The Efficient Lighting Pilot Program promoted energy-saving lighting solutions and achieved an average of 50% reduction in the energy consumption of the outdoor luminaires changed under the program without any significant drop in lighting levels. The pilot replaced with LEDs the mercury vapor and high-pressure sodium streetlights in two pilot cities and switchyard lighting within PLN substations and power stations. A total of 433 luminaires were retrofitted with LEDs in PLN’s outdoor switchyards and 500 more were procured for subsequent installation by PLN. The infrastructure investments were costly. To meet the expense, ADB and AFD have equally provided $50 million loans to PLN to purchase materials and pay the installation contractors. The street lighting program, on the other hand, was funded by ADB’s Clean Energy Fund. City governments participated in the pilot by acquiring knowledge on the technology and upgrading city street lighting on their own through designing, financing, and implementing their own programs. ADB, AFD, and the Clean Energy Fund shared PLN’s goal: provide reliable access to clean and efficient energy to the people. The project optimized energy in the Java-Bali network. Not only was electricity in the area made more reliable, it also became more efficient. The project has contributed to reduced distribution losses. The improved PLN network saves about 1,400 gigawatt-hours annually and distribution loss was reduced from 7.3% in 2013 to 6.3% in 2016. The project contributed to about 1.17 million tons annual reduction in CO2 emissions. The project also contributed to a surge in the number of customers and distribution sales. Under the project, sufficient additional transformer capacity was procured to connect almost 600,000 new residential customers and increase sales by 950 gigawatt-hours per annum. Power interruptions in Java Bali grid per 100 ckm line declined from 11.77 in 2013 to 8.54 in 2016. In addition, the pilot integrated into the project reduced by 50% the energy consumption of the retrofitted luminaires without any significant change in lighting levels. These results were not easy to achieve. This project illustrates that when strategic investments are shared by partners, shared goals that can benefit millions of people can be achieved. However, like any successful large investment-driven development project, the caveat lies in sustainability. The reduction in electricity losses resulting from the project will only be sustained if network development investment continues in line with the growth in demand for electricity supplied by the network. Sustained financing, including from concerned development partners, is needed to maintain the level of energy efficiency achieved by the Java-Bali grid. Ira Palupi works as Senior Project Officer (Infrastructure) at ADB’s country office in Indonesia, handling energy project implementation. Before joining ADB, she has been 10 years with the United Nations Industrial Development Organization in charge for energy and environment project development and monitoring, in addition to several years previous engagement with research institutions and consulting firm. Andrew Fransciscus works as Project Analyst at ADB’s country office in Indonesia, supporting energy project implementation. Prior to this role, he was supporting the portfolio management unit of Indonesia Resident Mission. Before joining ADB, he worked with large consulting firms for 6 years and served multinational clients from various sectors, including energy and mining.